Q. How do I find DVDs and videos in the library? If you are searching for audiovisual material, the library has options in several formats, ranging from VHS tapes to DVDs and academic streaming video services. The library has a large and ever-growing collection of video content for its patrons, ranging from VHS tapes and DVDs to streaming video services. 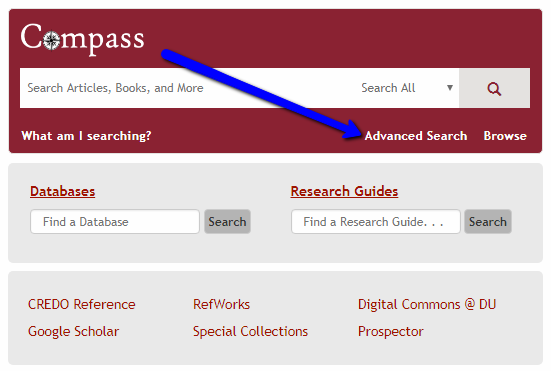 If you know from the outset that you are looking for a video, start from the "Advanced Search" feature in Compass. 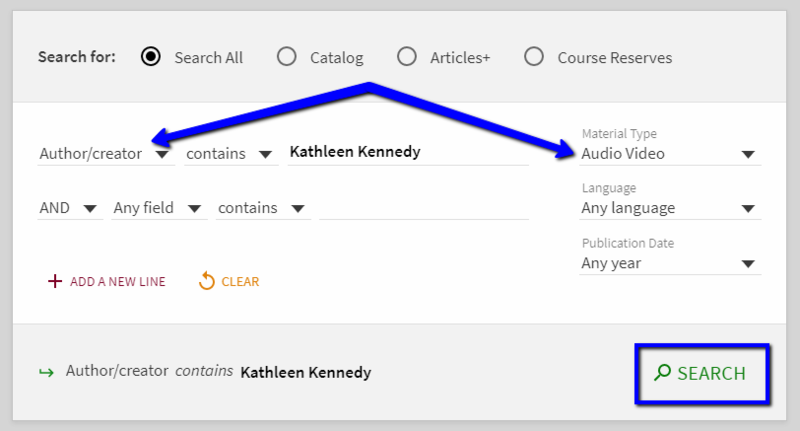 From here, be sure to change the "Material type" drop-down menu immediately from "All items" to "Audio Video." You can then perform several different searches to find the material you want. 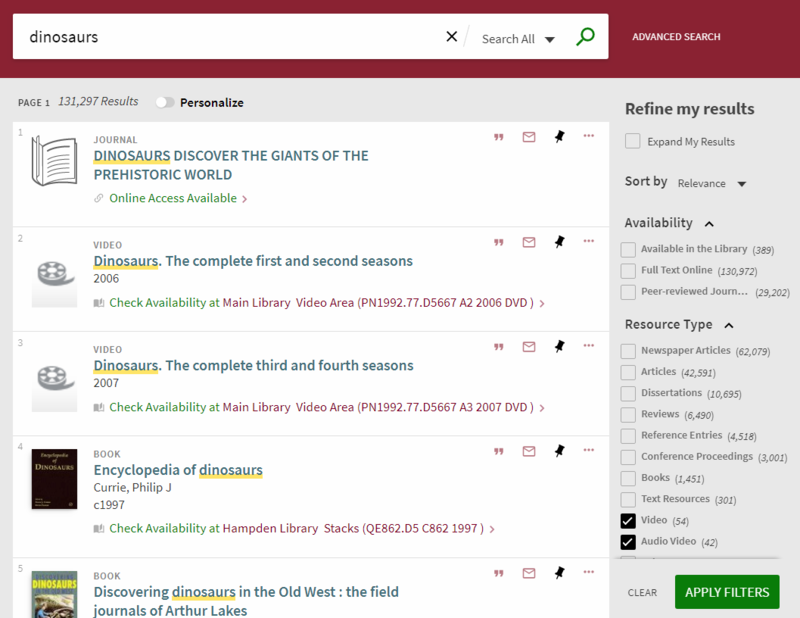 For example, you could search in "Any field" for dinosaurs, or if you know the title of the DVD or video you seek, you can change this drop-down menu to "Title." Thirdly, you could use the "Author/creator" field to find all items owned by the library for which a specific person, like Kathleen Kennedy, is credited as an actor, director, or producer. When you have filled all information pertinent to your request into the fields, run your search. You can limit to Academy Award nominees or winners by adding “Academy award” to your keyword search. If the item your want is a physical DVD, note the call number for the film. DVDs are located on the upper level of the main library, at the top of the main staircase, near the Loft. You can also use the Request feature to put a DVD on hold, and the Access Desk will retrieve it for you. In the event that you have already executed a search, you can use the factors on the right-hand side of any search results page to refine your results. Simple expand the "Resource type" heading and if your particular search contains any results that include "Video" or "Audio Video" content, you can select the appropriate boxes and "Apply filters." The page will then repopulate to show you only video and audiovisual content. The library has been rapidly expanding its streaming video holdings. While we can't help you Netflix and chill, you do have access to several streaming services of academic interest. 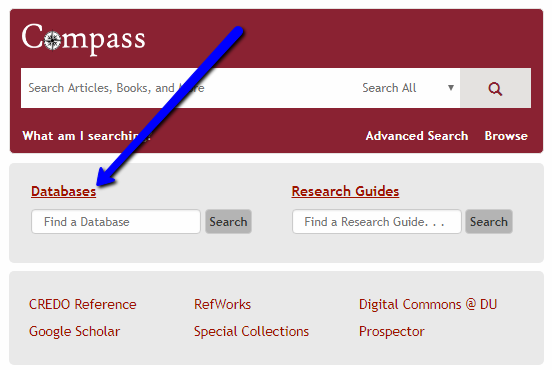 To find a listing of these services, start again at our Compass homepage, and click on "Databases." 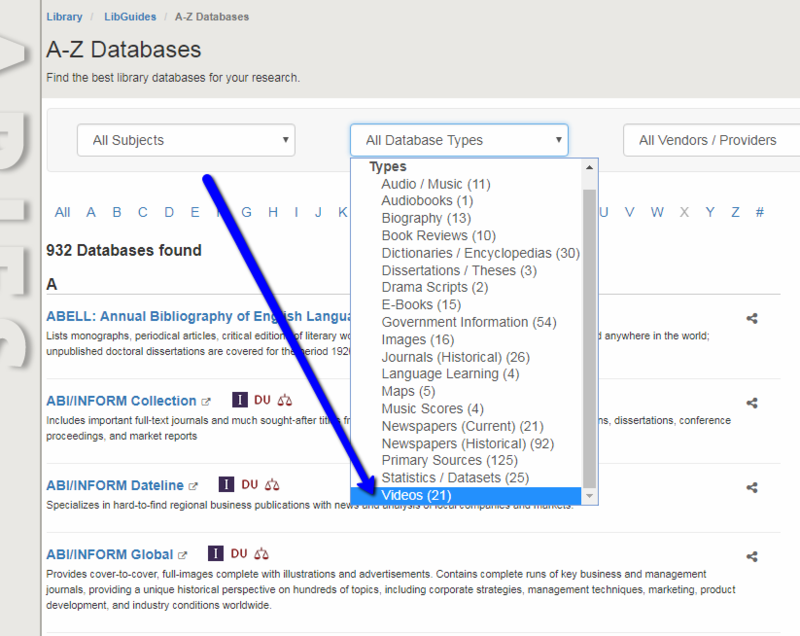 From here, use the "All Database Types" drop-down menu to select the current Video databases to which the library subscribes. This list will range from, for example, a 17-year collection of '60 Minutes' broadcasts to a collection of high-quality theater recordings, but the most comprehensive video streaming service available to DU patrons is called Kanopy. Learn more about Kanopy and other streaming video available through the library in our Streaming Media Libguide. If you need assistance with a video for your research or pleasure, please contact the Research Center via Webchat, email, phone, or in person!